See more objects with the tag collectors, architecture, interior, figures, light, neoclassical, churches, commemorative, printmakers, candles, cross, death, crowd, prayer, vaulted ceilings, tombs, relief. See more objects with the color darkolivegreen grey dimgrey rosybrown darkslategrey or see all the colors for this object. This is a Drawing. It was attributed to Louis-Jean Desprez. We acquired it in 2009. Its medium is pen and black ink, brush and brown wash, white gouache on cream laid paper, mounted on greyish-green paper. It is a part of the Drawings, Prints, and Graphic Design department. This dramatic scene of the interior of Saint Peter’s Basilica depicts tourists and worshipers viewing the large cross (eight meters high and incorporating 628 oil lamps) that was displayed annually during the celebration of the Holy Week preceding Easter. The drawing is attributed to the French-born architect and painter Louis Jean Desprez. Desprez was trained as an architect at the Académie Royale d’Architecture, where he was a pupil of Jacques-François Blondel and Pierre Desmaison. In 1776, he won the Prix de Rome and went to study at the French Academy the following year. Through the Academy director, Joseph-Marie Vien, Desprez was hired by the Abbé de Saint-Non to accompany him as draftsman through Sicily and Naples to provide illustrations for Saint-Non’s book Voyage pittoresque ou description des royaumes de Naples et de Sicilie (Paris, 1781–86). 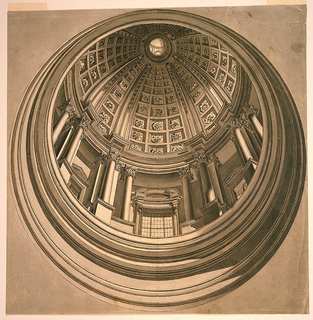 After the completion of the tour in 1779, Desprez remained in Rome where he collaborated with the printmaker Francesco Piranesi on a series of hand-colored etchings of Roman and other Italian views. The proposed drawing is related to this project. In 1784, Desprez accepted the initiation of King Gustav III of Sweden to design theatrical decorations for the Royal Opera House in Stockholm. Eight years later, he was made First Architect of the King and worked on many projects for royal residences. His patronage ended when Gustav was assassinated. Desprez died penniless in 1804. Desprez was an original and facile draftsman with a great imagination. King Gustav is purported to have said, “There are only two people in Sweden who have imagination, Desprez and I.” Desprez’s taste bent toward the exotic, the fantastic, and occasionally the macabre. 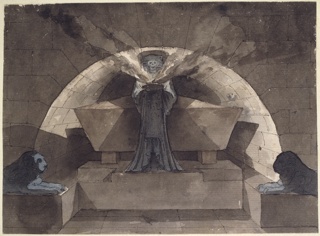 The stranger side of the designer may be seen in four drawings of “imaginary sepulchers” in the Egyptian style in the museum’s collection (1938-88-3950/3953). 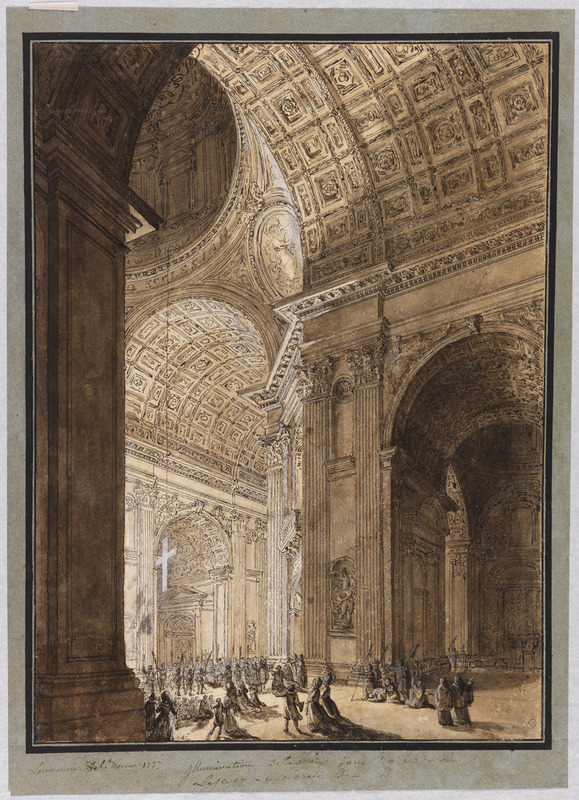 The popularity of this dramatic subject brought many artists to Saint Peter’s to produce drawings and prints for tourist consumption, including Francesco Panini, whose drawing of the subject is also proposed for acquisition. 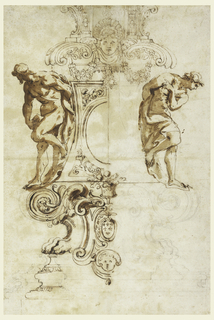 The two sheets, as an ensemble, would make a wonderful comparison for anyone working on Roman views by Piranesi and his contemporaries.